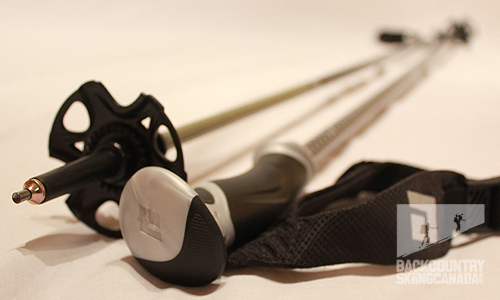 Black Diamond produces nine styles of ski poles and a further twenty-one styles of trekking poles. They literally have a pole for every occasion. The variety is nice but can make your choice a little daunting. 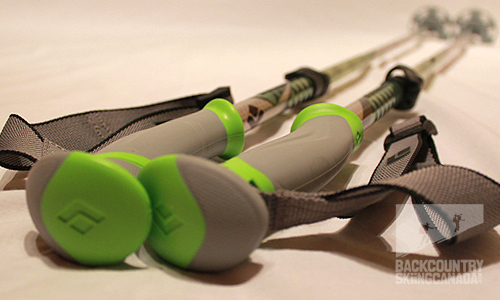 So, which is best suited for backcountry skiing you ask? That really depends upon what type of skier you are and what features are most important to you. In order to minimize the guess work I have whittled the selection down and focussed this review on just three poles. These are: the Black Diamond Fixed Length Carbon Pole, the Black Diamond Pure Carbon Pole and the Black Diamond Compactor Pole. Each of these poles is unique in their own right but are also well-suited to backcountry skiing (and many other alpine sports should you require a more versatile choice). This is the strongest pole in the Black Diamond line up (thanks in part to its fixed length design and use of carbon and Kevlar materials) so the Black Diamond Fixed length Carbon Pole can take a lot of abuse but still not weight you down. At just over a pound these poles are light, but you do have to be careful how aggressive you bang snow off your skis as carbon does not react like metal poles, it won't bend - it will sheer right off. The new kevlar wrapped lower of the pole should help with this issue but you still need to treat these babies with respect. 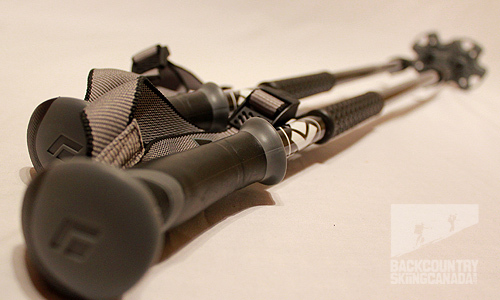 This is not a backcountry specific pole per say as it does not collapse for easy storage or have additional features that may compliment hiking. 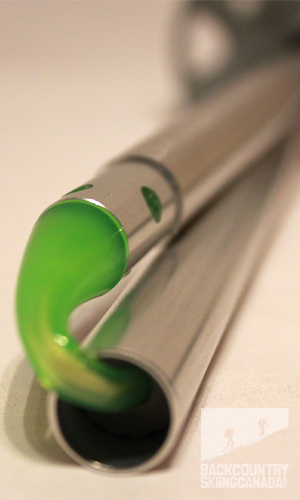 However it's simplicity, light weight and strength makes it a reliable choice. If you were to ski tour with the Fixed Length Carbon Pole the first thing you should do is swap out the free ride basket for a powder basket - unless of course you call the eastern seaboard home. 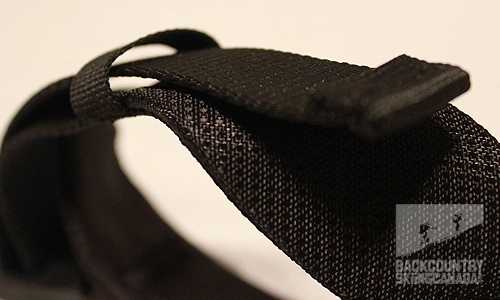 Black Diamond has made several new upgrades to this product over previous versions. 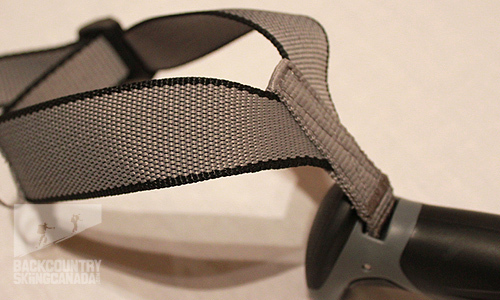 The first is that it now has an ergonomic Power Series strap which is easier to get into and much more comfy (not that you should ever wear your pole straps while skiing in the backcountry due to tree wells among other things). Second is the Power Series grip which is softer on the hands and incorporates a more generous top hook for undoing your boot buckles should you wish to use this rather than your frozen digits. 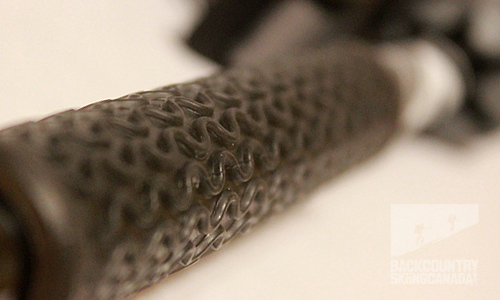 Carbon is strong and light but can still break if you hit it hard enough on a ski edge so be warned - take it easy. Needs a powder basket for true backcountry use in Western North America. To have this pole slot into the efficient series line up Black Diamond had incorporate several design features to reduce weight. 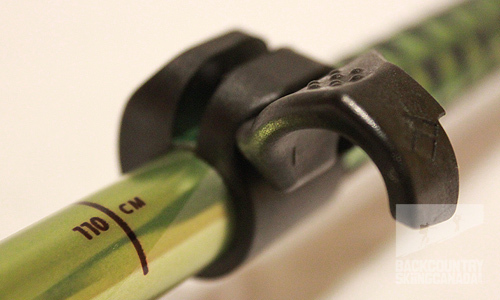 The Pure Carbon pole weighs only 3 oz more than the Fixed Length Carbon pole however it incorporates a powder basket, FlickLock adjustability and grip extensions. 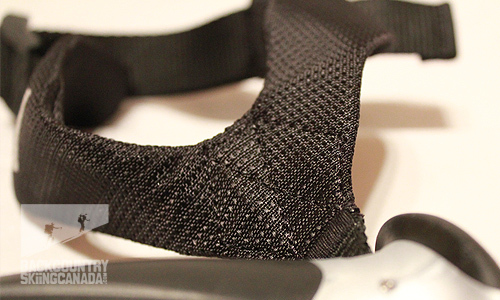 To shave off this required weight Black Diamond used 100% carbon fibre and a lighter Efficient Series grip and strap. 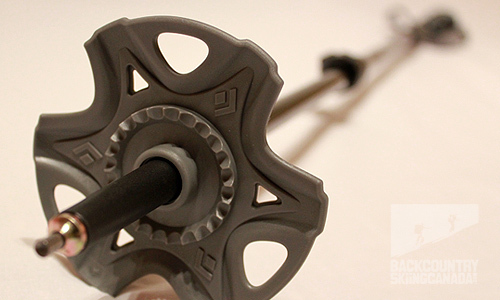 So not only do you have adjustability you also have a pretty darn light ski touring pole. The two piece construction with the FlickLock mechanism gives you 50cm of adjustability while being more stable than a three piece pole. 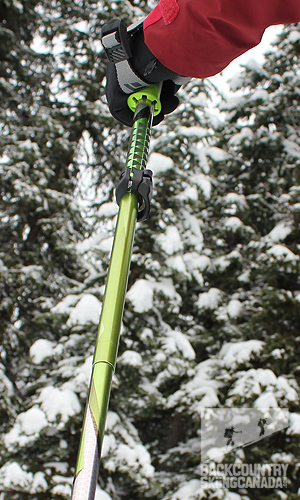 My favourite feature on this pole and the one that makes it a backcountry ski pole first and foremost is the rubberized grip extension for side-hilling and steep up tracks. The fact that is is not much heavier than the Black Diamond Compactor Ski Pole or the Black Diamond Fixed length Carbon Pole is also a huge plus given that it comes with similar grips and straps and comes with generous powder baskets. A light pole with lots of adjustability and the option to choke down on the rubberized grip makes this a winner right out of the box. 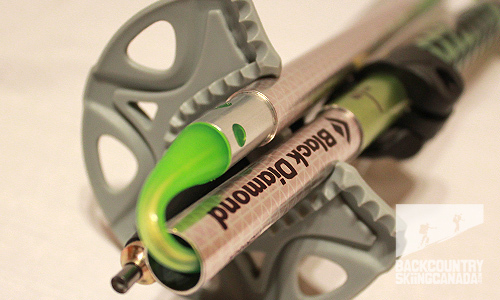 Black Diamond pushed the boundaries of innovation and came up with the Compactor Ski Pole. It takes a 135cm poles and folds it down into a fairly compact 40cm length which is ideal for snowboarders and approaches. 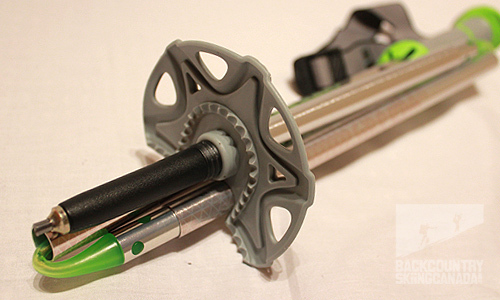 The folding Z-Pole technology uses an internal metal/plastic cable and operates similar to your standard avalanche probe. The locking mechanism ensures the pole can take your weight while skiing and is easy enough to release when you want to fold them away. The internal cable system is designed with what Black Daimond calls the 'speed cone' which means that as the cable attaches to the pole length it is shaped like a cone to allow for easier assembly. 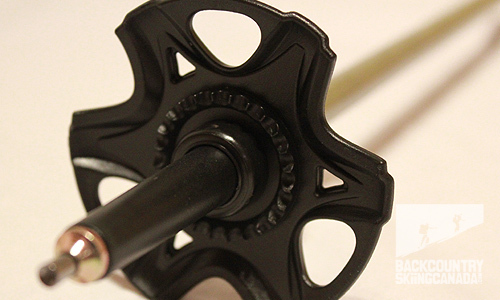 The FlickLock adjustment mechanism provides up to 20 cm of adjustability and is similar to the locking mechanisms on other BD poles. The stability provided by the Black Diamond Compactor Pole is impressive given this new design however you may have to fine tune the cable tension over time as things stretch out. The addition of a textured grip provides the ability to choke down on the poles on those side hill skin tracks and the Flicklocks 20cm of adjustably make these adaptable to up and down climbing on snowshoes or off season hiking. Once the poles are collapsed the powder basket provides a convenient pole dock to hold things together nicely. Versatile pole for 4 season use with quick, compact storage. The two lower sections of the pole are able to rotate since the locking mechanism is not nested into the upper pole body, not a big deal but re-aligning the powder basket is required from time to time. Not the sturdiest of the poles reviewed here. 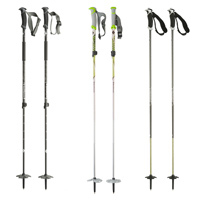 Three unique pole designs from Black Diamond offer very different features but all maintain a strong, light weight option for backcountry skiing. 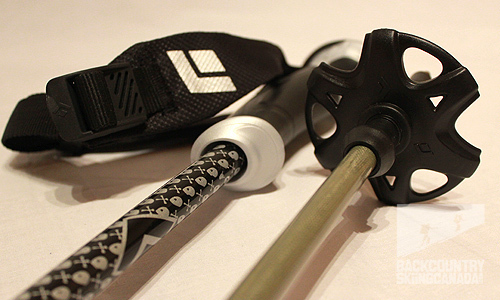 If you value adjustability over pure strength then the Black Diamond Pure Carbon Pole is the hands down winner. However it you require a good slack country ski touring pole that will only occasionally see terrain beyond the ski resort boundary then the Black Diamond Fixed length Carbon Pole is for you. 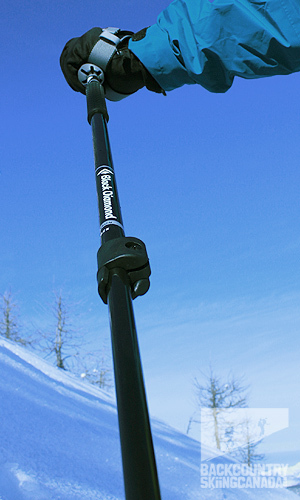 If you are a split boarder or just want a pole that packs down to nothing and still affords 4 season use then I would recommend the Black Diamond Compactor Ski Pole. 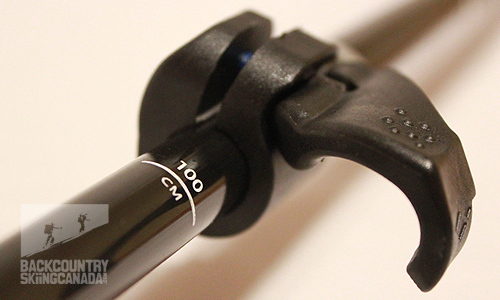 If you are after the sturdiest pole then go with the Black Diamond Fixed length Carbon Pole. This is followed closely by the Black Diamond Pure Carbon Pole and in a distant third place would be the Black Diamond Compactor Ski Pole. This is only our opinion. Do you disagree? Did we miss something? Are we totally out to lunch? Join the discussion in the forums here, and let us know what you think. People like/dislike gear for different reasons so chime in and we'll get a well-rounded evaluation. Check back mid-season to see how our review stands up to our in-the-field testing. 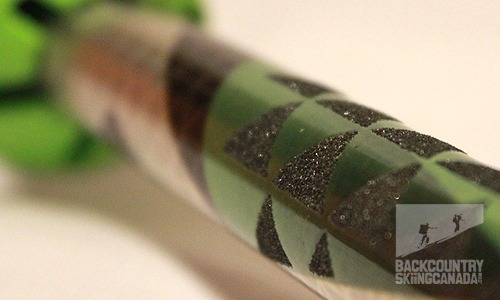 The Black Diamond poles reviewed above all continue to perform well over the last two season. 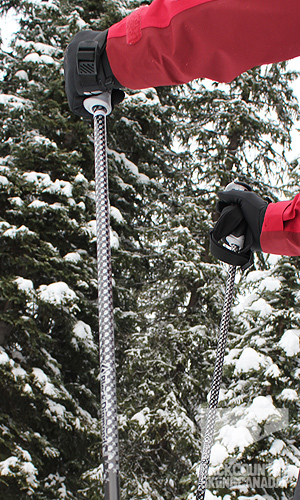 The Black Diamond Fixed Length Carbon poles are my poles of choice for skiing at the resort, the only modification I have made is to remove the pole straps. Due to tree well dangers here at my home resort of Whitewater I decided to remove the straps so that there would be no temptation to use the straps and reinforce bad habits. The Black Diamond Pure Carbon Poles are the poles I use for every backcountry ski tour and therefore they have seen a lot of action. 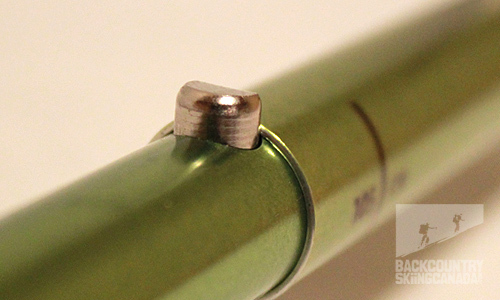 One of the rubberized grips has come loose and after talking with BD they recommend just gluing it back in place. Black Diamond has not seen this issue before and their recommendation worked like a charm. The compactor pole has been converted over to my hiking pole given its compact size and it too continues to perform well. It's worth noting that all of the "Fliplock" mechanisms are now made of metal instead of the plastic you will see in the pictures above.